This is a universal LNB that can receive linear satellites (Europe etc.) and circular satellites(Americas) without any change of LNB. One motor adjusts the LNB between linear and Circular, and the other motor adjusts the linear pol angle. This is controlled automatically from the antenna control unit when switching satellites. 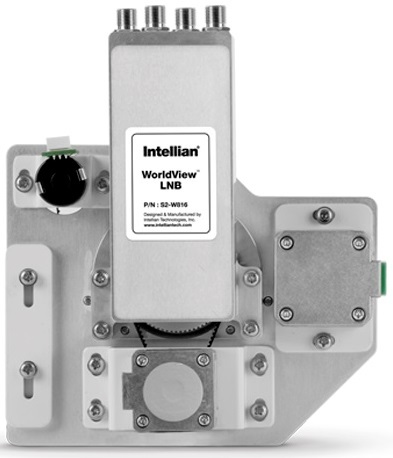 The LNB can emulate any standard LNB local oscilator. These LNBs are used on all Intellian W series like t80W, t100W, t110W, t130W. Note that the GLA LNB requires a spacer ring (also known as the "wedding ring") inserted in the feed before the LNB. From what I have been told, the spacer ring can remain in place when switching back to US or Europe LNBs. Switching is done by multiswitch. SeaTel P/N 132497-1 Includes LNB and balance weights. This LNB is lighter than the Brainwave and may require less rebalancing of the antenna. Note: All 4 ports are universal and controlled individually by tone and voltage. Unlike the Brainwave, there are no dedicated HL, VL, HH, VH ports. 43108 visits to this page since 28 Nov 2012.